The food industry has a long history of finding ways to become more sustainable and values continuous improvement in these efforts. It recognizes that a commitment to sustainability not only makes good business sense, but that the continued viability of the industry is dependent upon the success of these continuous efforts. Through raw products, the food industry is directly linked to and reliant on a healthy environment. Through employees, suppliers, partners and customers, the industry and communities are directly connected and interdependent. whether the issue is food safety, energy, environmental, workforce, or tax policies. Sustainability is the overarching philosophy that guides our efforts in all areas of concern. Sustainable practices ensure the continued viability of the food industry. Food Northwest's Sustainability Committee develops and recommends policies, priorities and activities as well as guides the development of sustainability resources and tools and the programming for the annual Sustainability Summit. Members of the food industry are taking action and investing in the future of the industry, their communities, and the planet. 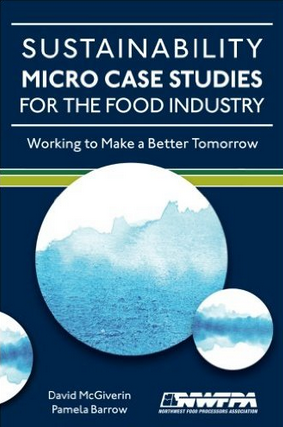 In Food Northwest's updated & expanded publication Sustainability Micro Case for the Food Industry, food companies and suppliers share real life sustainability practices and actions that they are taking to become more sustainable.